Easy and accurate employee time tracking for businesses of all size. Proper employee time tracking is at the cornerstone of every productive labor force. Without it, employers will inevitably struggle to schedule profitable shifts, create accurate labor budgets and submit error-free time cards to payroll. But without a dependable, easy time clock, employee time tracking can cause huge headaches for management and payroll, not to mention huge fines for the business. Since the release of our employee time tracker app in January, businesses across the country have enjoyed the benefits of a more engaged, productive workforce, and accurate time and attendance data to send off to payroll. But allowing employees to clock in and out right from their phones isn’t the most viable business strategy for every company. Even with the geofencing capabilities of the employee time tracker app - which allows managers to set GPS restrictions on where employees can clock in and out from - some employers want to ensure their shift workers are on site and punching in and out from a dedicated time clock station. Now, we have an app for that too. Introducing: the Orbital Shift Punch Clock. 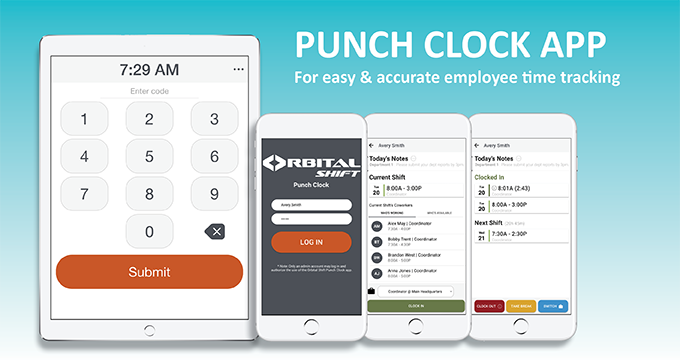 The Orbital Shift Punch Clock app helps create a more efficient and productive workforce for businesses of all sizes. Employees can get on and off the clock with a few taps to a dedicated device - phone or tablet - located anywhere with an Internet connection. Businesses can have as many Punch Clock Stations as they need, so employees won’t have to wait in line to punch in and out of one single time clock machine. Similar to the employee time tracker app, once a staff member enters their unique numeric code, they’ll see notes for the day and information for their next shift - everything they need to be fully prepared and ready to hit the ground running. With a countdown timer that tells workers exactly how many hours and minutes until the start of their next shift, the number of missed shifts and late arrivals will decrease, while employee accountability soars. When staff can get on the clock and simultaneously receive the most important information they need for the day, it frees up managers to focus on running the store or department, rather than having to spend time getting every individual staff member up to speed. And when all levels of staff have more time to focus on their work tasks and tend to customers, labor productivity improves, and profits start to grow. The accuracy of the online time tracking system also ensures employees will receive the right amount of money in their paychecks every month. According to a 2017 Kronos survey, 54 percent of American workers have received incorrect paychecks. That’s a huge percentage of employees who have to spend their own time, as well as company time and resources, to fix an issue that’s easily avoided when the right processes are put in place. Don’t waste another second of company time fixing time cards and paychecks or giving the same briefing to dozens of employees everyday. Let the Punch Clock App do the tedious work for you, so you can focus on what really matters: running your business.